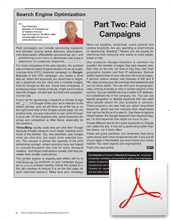 Paid campaigns can include sponsoring keywords and phrases, buying space (banners, skyscrapers, mini-skyscrapers, eNewsletter sponsorships, etc. ), and buying premium positions in directories and buyer's guides. That's more or less the order of importance. For most companies in the wire industry, the quickest way to improve search engine results is to set up a paid, cost-per-click (CPC) Adwords campaign on Google. Basically in this CPC campaign, you create a short text ad, select the keywords you would like to target, set a maximum bid per click and a monthly budget, then let Google do the rest. Some wire companies, if producing mass market products, might want product ads with images, not text ads, but that's the exception, not the rule. If your bid for sponsoring a keyword or phrase is high enough and if Google thinks your ad is relevant to the search phrase, your ad will show up at the top or on the right hand side of the Google results page. On the positive side, you pay only when a user clicks through to your site. On the negative side, some keywords are pricey and competition is often fierce, especially for top positions. Yahoo/Bing usually costs less per click than Google because Google, being so much larger, reaches much more of the market. You, the advertiser, pay Google more per click-thru, but reach more potential buyers. The concept is almost the opposite of the print advertising concept, where economy buys are based on cost-per-thousand—the cost for every thousand readers—and larger publications usually cost less per reader than smaller publications. The on-line auction is ongoing and others will try to outbid you for top positions, so your campaign should be monitored at least monthly. Check the budget and the ad's position to ensure it is on the first page for each important keyword. Make sure your campaignfilters out negative, overpriced, overly general and useless keywords. Are you spending a small fortune on sponsoring "braiding"? Maybe you are paying for click-thrus from everyone who wants to braid beads, bread or hair. Use analytics—Google Analytics is common—to question the number of pages that paid viewers visit, their time on the site, the time of day they visit, their geographic location and their IP addresses. Serious visitors spend time on your site and visit a lot of pages. If serious visitors always visit between 9 AM and 6 PM, stop running your ad evenings and weekends and cut out some waste. You can limit your ad geographically, running it locally or only in certain regions of the country. You can identify not only a visitor's IP address, but sometimes his or her company, too. You can use special programs to identify keywords that are used when people search for your products or services. These programs can also help you select long-tailed keywords, which are low cost-per-click keyphrases that narrow the focus of a search. Use these programs (WordTracker, the Google Keyword Tool, Keyword Spy, etc.) to find keywords that might not occur to you. Create different ads for the same keywords so Google can rotate the ads. If one ad is performing better than the others, run it more often. These are good practices, but remember that many users simply don't click on sponsored ads. If you put all of your eggs in this basket, you won't reach your entire market. You need organic site improvement. This is the second in a series of articles being published bi-mothly in Wire & Cable Technology. Part one is here. Part three is here. Check back soon for the next installment.